To every question and problem, he had the uncanny ability to marshal the entire breadth of his encyclopedic Torah knowledge, an unusually rich life experience, and a clarity of thought that cut to the heart of the situation. To revere Reb Yaakov was inevitable; to know him was impossible. He was accessible to everyone -- young and old -- on his or her own level, but there were so many layers to him that as soon as someone thought he knew him, he discovered a new dimension of greatness. 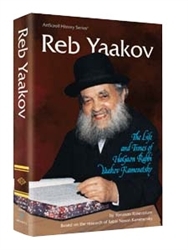 To an astonishing degree, this book presents a fully rounded portrait of Reb Yaakov. The author has drawn from hundreds of interviews and thousands of recollections to fashion a portrait of his life and personality. The reader feels rooted to the soil from which Reb Yaakov grew and at home in the many environments where he flourished. And the reader sees how a man saturated with Torah knowledge and the accumulated wisdom of its sages can relate that rich tapestry to both modern people and emerging dilemmas.